Over the years, many kind people have said some lovely things about our work. 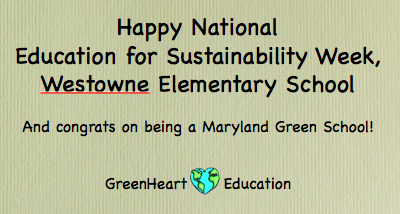 Here is a sampling of GreenHeart Education testimonials to help you decide how we can assist you in meeting your goal of greening the heart of education. "This workshop was unique. I was involved very much, and it helped me look at the school I am representing and [commit] to start doing something in my school." "This is a new outlook on education. I never used to think like this, but it's simple and it covers everything." "The workshop has challenged us to work and save our future." "The workshop was nice. Schools really need to adopt such principles, so that the entire schooling system starts greening." For the teachers in the Greening the Heart of Education workshop, all of the activities were so interesting. They especially liked the fun-like activities (songs, collecting nature's gifts, outdoor group work). 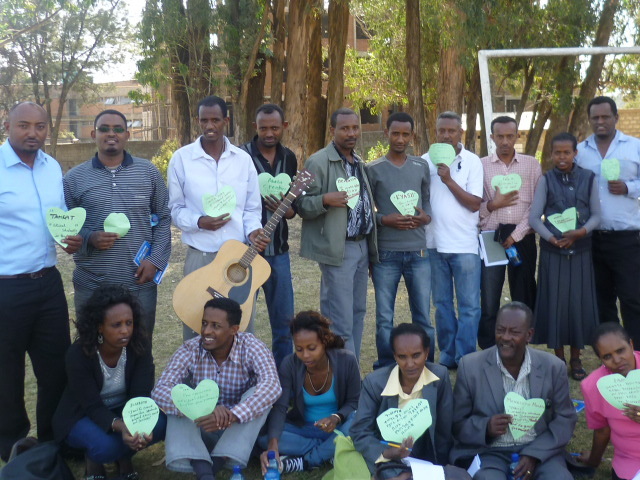 The green paper heart activity [see photo above] helped them get to know each other and their reasons for attending. The "human web" and interconnectedness activity was very exciting for everyone, and everybody agreed that climate change has affected each and every one's life. After the presentations and different activities, especially after the audit, the participants concluded that greening these three dimensions of education is possible and very crucial. For almost all of them, working on greening their own and their schools' behavior and attitudes was the most important one. This part of the discussion was very burning. As individual teachers, they underlined that every colleague should go through such an eye-opening workshop. It changed the mentality of many teachers and school principals because it deals with "the real issues" of schools. They also suggested that this concept should be delivered to educational authorities. Teachers can make a difference if they are given the opportunity to green the heart of education with their full potential. I am so thankful that you were able to be with us for the last few days. Thank you for sharing your insight, your excitement and your contagious energy — your (green) heart. You certainly have inspired me through your ways of being and knowing. Especially thank you for the meaningful ways you tied your important messages of hope and action to our context. Much gratitude. Julie Johnston presented an hour-long virtual workshop entitled Greening the Heart of Education Through Courage and Compassion to about 50 staff members. Using videoconferencing for professional development was certainly attention grabbing. Julie was able to express the dire need for greener education without using scare tactics. She maintained this type of positive message throughout the presentation. She addressed how to incorporate greening our curriculum through multiple grade levels in order to maintain relevance for everyone, and intertwined small group hands-on activities that emphasized a key point while keeping the interest of the participants. Julie presented "tools" and practical applications for greening education today. She used data as well as historical quotes as support. Julie even made sure to research our school's green initiatives in order to include them in her presentation. Following the workshop, I overheard many colleagues talking about some of the ideas that were presented and how they were planning to implement them into their classrooms. I had colleagues come up to me to tell me how much they enjoyed the webinar and to inquire about how I found Julie, because she was so knowledgeable and perfect for this type of learning experience. I would highly recommend Julie for any type of professional development for a school that is already green and/or wants to be greener. She is passionate about sustainable development learning and it is contagious after seeing her presentation. I'm so happy that we had Julie Johnston present to our staff. Julie is very passionate about sustainability education. Because she tailored her presentation to our school, she suggested many ideas that could realistically be implemented here. I particularly loved the idea of having a school orchard, more plants in the classroom, an idle-free zone in our parking lot, and a walking school bus. I also love that she made us remember how important it is to take our students outside into nature to play and learn. I'm co-chair of our green committee at school so it's my job to try to get as many people to take part in the green revolution as possible. Sometimes I feel down and like I'm spinning my wheels because teachers don't seem to have the time to think and be green when they are so swamped with other responsibilities. Julie reminded me that we are being green to save our planet from global warming and climate change and that it's our job to instill a love of nature into our students so that they will continue to do good work when they leave school. She reminded me that I have no choice but to do the best I can to help our planet. She reminded me that there is power in just being a role model. Julie definitely had a powerful effect on me. Just knowing that there are other people out there who are as passionate as I am — or actually more passionate — motivates me to be better. Today at recess, my class and I went outside and picked up all the trash left from the people that [used] our school yesterday. And I connected a lesson on the water cycle to the importance of keeping the little fresh water we have pollution free. I feel like I have my green mojo back thanks to Julie! The Philippines has passed RA 9512 mandating all schools to integrate environment education. I feel I am very lucky and blessed to have you as my mentor in teaching environmental education at the secondary level. I am also very happy and proud to inform you that I finished my Master's research (environmental integration in teaching chemistry). Thank you for all the help and learning from you. 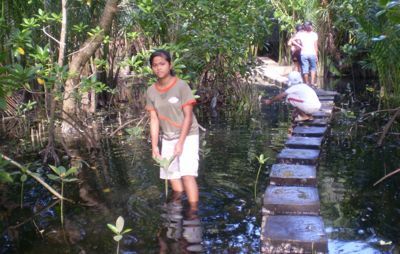 I am attaching a photo of our YES-O (Youth for Environment In-School Organization) mangrove planting project. So many new perspectives. Thanks for the insights and affirmations. Great information. The slides that illustrated the different forms of environmental education at various ages/grades were very valuable. Julie's approach to relaying the information to us was a calm, thoroughly organized presentation. It was very down to earth and the ideas were doable. It helped give me a direction. What did I like best? Julie's courage and compassion. Thank you, Julie, for a great talk! Your presentation was so organized and thorough. I truly appreciate the effort you clearly put into this. Thank you for all the great information, resources and places to explore. Nature is all around us ... and I learned a lot about it from you. I liked the Heart Spots. I really hope that you come back next year. Thank you for the nature program. I liked the mask part the best. My favourite activity was the one where we made our own perfume. Thank you for giving me this gift of knowing so much about nature! It was so much fun doing the terrariums and other activities with you. You have done exceedingly well at helping us find ourselves in nature. Thanks for teaching me to be more aware of things around me. Thank you, Julie, for teaching us about nature. The best part was learning to be friends with nature. 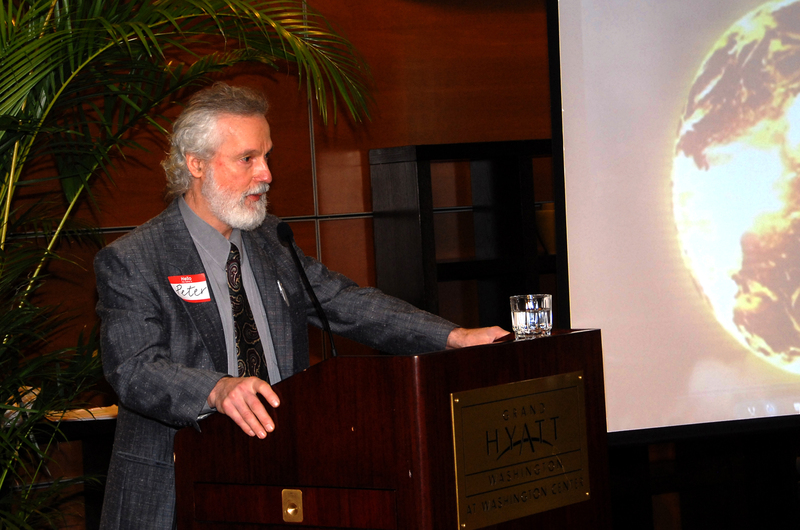 The forum was a great opportunity to wholistically experience a sustaining community. It's doable and it's exciting. I learned that we all have to participate and that the environmental, economic and social problems are all entwined and connected. Thanks, Julie, for a well-researched and inspiring presentation. Thank you so much for your valuable contribution to Canadian Curriculum Studies. We are very proud of this collection and could not have done it without you! My students told me that your [climate change] presentation was clear and thought provoking. They were glad they attended. Julie Johnston's workshop on Environmental Social Marketing to our board and employees was well organized and very interactive. Her unique approach to learning gave us tools to use in our workplace, and we went away with helpful action steps to take. Julie received rave reviews for her workshop on Voluntary Simplicity. Her style is easy yet personally compelling as she takes you through an often humourous realization of how to reduce stress and achieve focus in your day to day life. I enjoyed reading your thesis over my morning coffees last week. Fascinating and highly relevant stuff. Thank you so much for your insight and interest, your input and enthusiasm. Julie Johnston is truly one of the most knowledgeable and compassionate environmental educators on planet Earth ... please support her GreenHeart Education program. Since Dr. Carter's presentation on Pesticides and Children's Health, our whole family has gone organic! The Islands Trust Council recognizes the value and importance of the climate change work that you do in your community…. We sincerely thank you for the contributions that you have made to your island community and encourage you to keep leading the way. Thank you, Peter. Your video is one of the best I have seen integrating the various facets of climate change. Thank you! I am hoping that linking to your informative video will educate our teachers and students, propelling them to make changes and inform others.